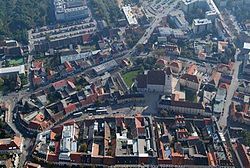 Eisenstadt (German pronunciation: [ˈaɪ̯zn̩ʃtat]; Hungarian: Kismarton, Croatie: Željezni grad, Željezno, Slovenie: Železno) is a ceety in Austrick, the state caipital o Burgenland. It haes a population o aboot 14,241 (2016). In the Habsburg monarchy, Kismarton (Eisenstadt) wis the seat o the Eszterházy Hungarian noble faimily. The componer Joseph Haydn leeved thare as Hofkapellmeister unner Esterházy patronage. This page wis last eeditit on 25 Juin 2017, at 18:06.